There is something so odd about going to my Rheumatologist, Dr. Weitz’s office and seeing all these people, patients, like me, at different stages in their journey with Arthritis. And to think, maybe she’s experiencing these unusual symptoms for the first time. Maybe she doesn’t even know what’s wrong with her and here she is, sitting in a waiting room with all these “sick people” in wheelchairs and with walkers and canes. How terrifying we must all look to her. How scared the woman must be. I know I was. It felt as if I was having a flashback of when I was the New Patient, anxiously sitting in the waiting room -scared to death of what the future might hold. I had so many unanswered questions. Will I be able to walk again? Is this doctor going to help me? How bad is my RA? I had had a rheumatologist before, the same one who diagnosed me when I was 5 years old in 1996. But, to be honest, we weren’t getting along. I felt like he wasn’t treating me or at least trying to treat my disease. We disagreed a lot on how well my Arthritis could be controlled. He told me multiple times that I should just accept the fact that I was disabled now. But I wanted to fight back, try any and every treatment available. Well, finally, one day, my husband and this rheumatologist got into an argument about my prognosis. We told him we weren’t ready to just “accept it and move on.” I was too young for that! I was 19 and still had many more fighting years left in me. If the treatments didn’t work, fine. But I wasn’t going to give up WITHOUT EVEN TRYING! 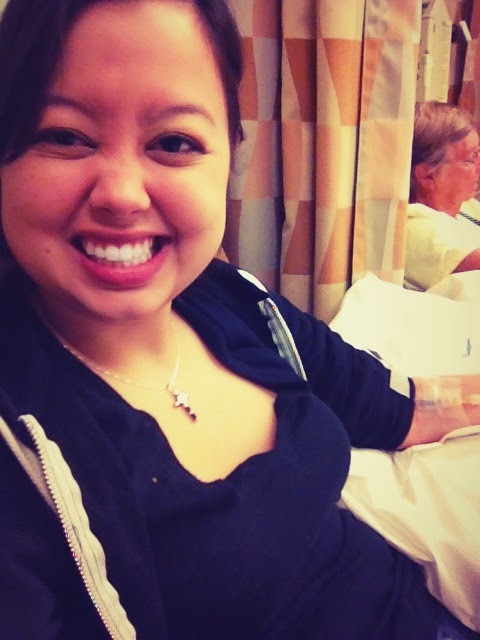 Me, at my first-ever infusion. We’re all just like you, waiting, hoping, praying, fighting. We’re here for the same reason. To fight this disease and aim for success in better health. We’re here because we’re fighters.